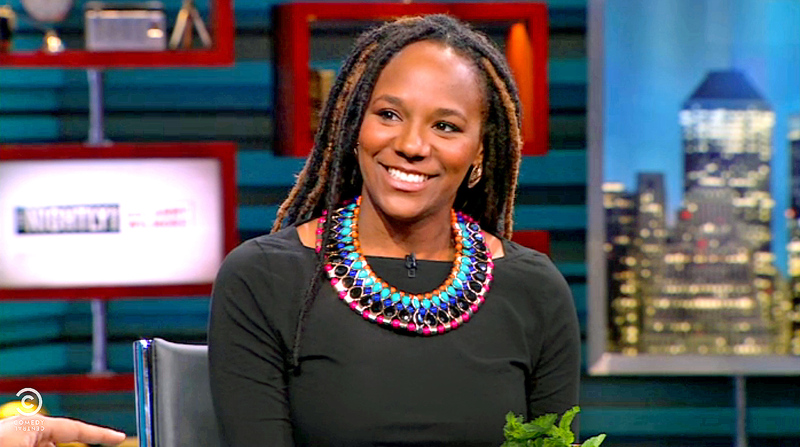 The second annual 44 Days Honoring Black History is pleased to announce that Bree Newsome, artist, grassroots organizer, and advocate for racial justice, will be the featured speaker on Monday, Feb. 25, at 7 p.m. in the Soda Center. RSVP to attend by clicking here. Newsome gained national attention in 2015 when she climbed the flagpole in front of the South Carolina Capitol building and removed a Confederate battle flag that was originally raised in 1961 as a racist statement of opposition to the Civil Rights Movement. Her activism took place 10 days after racist gunman Dylann Roof murdered nine black worshippers at the African Methodist Episcopal Church in Charleston on June 17, 2015. After national outrage over the slaughter and images of the killer holding a Confederate flag and a gun, S.C. lawmakers voted to permanently remove the flag. It was officially lowered on July 10, 2015. These incidents reignited controversy over South Carolina’s continued endorsement of the Confederate flag as a symbol of hate. Newsome’s act of defiance against the culture of white supremacy has become a symbol of resistance and the empowerment of women. Newsome’s roots as an artist and activist were planted early. Her father, who has served as the dean of the Howard University School of Divinity and the president of both Shaw University and the National Underground Railroad Freedom Center, is a nationally recognized scholar of African American religious history and how it has impacted social justice movements. Her mother spent her career as an educator, addressing the achievement gap and disparities of education. Growing up in an activist household fostered Newsome’s passion for social justice. An avid creator of art, she showed promise at an early age and at the age of seven learned to play the piano and wrote her first piece of music. Two years later, she wrote her first play. At the age of 18, Newsome won a $40,000 scholarship from the National Academy of Television Arts and Sciences as part of a short-film competition. Newsome studied film at New York University’s Tisch School of the Arts. Her senior year short film, “Wake,” won numerous accolades and was a finalist for the prestigious Wasserman Award, whose past recipients include Spike Lee. ​Much of Newsome’s activism has focused on incidents of young black people being unjustly killed and issues related to structural racism. She traveled with a group of youth activists from North Carolina to Florida during the Dream Defenders’ occupation of the statehouse as a protest against the killing of Trayvon Martin. She also participated in an 11-mile march from the Beavercreek, Ohio, Wal-Mart, where John Crawford was killed by police, to the courthouse in Xenia, Ohio, demanding release of the footage showing the killing. From 2013–2015, Newsome served as the Western field organizer for Ignite NC, overseeing a fellowship program for youth and student organizers; and she is a founder of The Tribe, a grassroots organizing collective based in Charlotte, N.C. The Tribe was created in the aftermath of the 2014 uprising in Ferguson to address similar issues of structural racism and police violence confronting the community of Charlotte. During the 2016 uprising in Charlotte following the killing of Keith Lamont Scott, Newsome helped organize protests and community meetings. She continues to organize at the grassroots level in Charlotte, focusing on developing models for sustainable community organization. Newsome’s dedication to community work has not lessened her interest in film or music. In 2016, she wrote, produced, and directed “Rise Up and Go” as part of The Monticello Summit, a four-day public summit on the legacy of slavery and freedom in America, held at the site of Thomas Jefferson’s former plantation. The celebration was a collaboration between the Thomas Jefferson Foundation, the National Endowment for the Humanities, and the University of Virginia. Newsome’s numerous awards include a 2016 NAACP Image Award in recognition of her work on behalf of civil rights. She currently lives in Charlotte, where she continues her work as an artist and grassroots community organizer. Several events and speakers are planned for 44 Days Honoring Black History. Visit the 44 Days website for the most recent information, as the schedule updates regularly. In the spirit of inclusive excellence and to acknowledge President Barack Obama, the nation’s 44th commander in chief and first African American president, the 44 Days initiative highlights the rich contributions of black culture to the nation, the world, and the SMC campus. Beginning in mid-January, 44 Days features signature programs, events, and workshops that echo the theme of “Strength in Community,” which reflects the African American historical legacy of people of color joining together to resist oppression and bring about necessary change in our society.